I chose “Paranormal Activity”. Instead of going for my normal poem I thought I would share a short story. 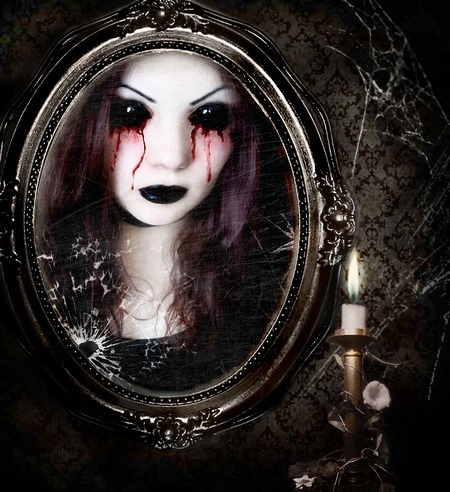 I stared at the mirror for hours. Nothing, staring back. Where’s my reflection? Puzzled and scared, I longed to see my shoulder length mousy brown hair, pale blue eyes and porcelain white skin. I raised my hand up to my cheek, ice-coldness hit me. My cheek no longer felt like mine, soft and warm. It was hard and smooth. My brain didn’t commute what my body was telling me. I looked down. My long white satin nightdress covered in a dried crimson coating. Very little of the white satin showing through. Is that blood? Frozen to the spot, I continued to stare at my bloodstained clothing, contemplating what happened. I turned my head left, towards the front door, the window was dark, it was nighttime. I moved my head to the right, down the long hallway to my bedroom. My sanctuary. I walked down the hall, aware I felt like I was walking on air and the grace of a ballerina, compared to my normal clumsiness. Even though my feet were bare, I could not feel the sponginess of the cream carpet beneath. I kept going, towards my bedroom. The door was slightly ajar; I could see a small amount of light filtering through. I pushed the door open slowly, it creaked. It felt heavier than normal. No sound came from within the room, it was eerie. No hum from the television, no whirring from the laptop. My laptop was my lifeline. I pushed the door with all I had and it opened enough for me to squeeze through. My bed was the first thing I saw. My covers askew, that was nothing new. I took another step. My bedside lamp was on. I looked to the television, it was off. Strange! I looked to my left, where my laptop sat. In its place was a bloody hand print next to its cable. I looked down at the floor, bloody footprints and a trail of blood towards the back corner. There wasn’t much light, I could see something but I didn’t know what. My heart started to pound and my hands started to shake, as I started to walk towards the corner. As I got closer, I couldn’t believe what I saw. It was a person slumped over in a pool of dark liquid. I kept walking even though I was terrified. I tilted my head to see the person’s face but their long dark hair covered it. I was standing in front of the person; they were wearing the same white satin nightdress as I. I knelt down in front of their face, on the balls of my feet in case I had to move quickly. I gently reached out to move their hair. I fell back. My face was staring back at me. The reflection that I could no longer see. Wow! Amazing story! Really scary too!